Catching two largemouth bass on a single lure with a single cast is not an everyday occurrence. During 50 years of bass fishing, I’ve seen it happen four times. I saw it twice on a beautiful May day several years ago, and both times the bass fell for a prop bait. My friend Bill and I were fishing a large shallow reservoir. Bill had fished there before, and I’d heard his tales about huge catches of monstrous largemouths. But even his embellished yarns hadn’t prepared me for the action we would experience. We started out working spinnerbaits around brush, a tactic that produced two small bass. Then Bill tied on a topwater—a Smithwick Devil’s Horse—and tossed it toward shore. Bzzzzzz! Bill ripped the bait through the water, producing a noise not unlike that made when an electric blender is set on frappé. I was about to ask what kind of monstrosity he’d tied on this time, but before I could, the water beneath his plug erupted, and Bill set the hook. As fish raced for a weed bed, there was a second violent strike. Bill’s rod bent even more. That’s exactly what happened. As the first bass rushed toward the weed line, a second one darted out and tried to take the “prey” away. Bill tussled with the fish a while, then landed two dandy largemouths hooked on the trebles of the single prop bait. One weighed a little over 5 pounds, the other just a bit under 4. Before Bill released the fish, I had tied on a Devil’s Horse, too. Over the next five hours, we landed 30 more largemouths. All of them waylaid a prop bait, and the last catch was as exciting as the first. On that cast, you see, I made a double hook-up myself and landed a pair of 1-pound largemouths that had nailed my prop bait simultaneously. You may not catch two bass on a single cast, but watching the wake of a big bass homing in on a sputtering prop bait is one of the greatest thrills of bass fishing. If you’d like to experience it yourself, now is one of the best times to try, for May offers some of the year’s most consistent topwater bass action in many areas of the country. As the water warms in spring, bass migrate from deep winter haunts to shallow shoreline cover, making them easier to find and catch. Bait animals also move to shallow areas, and bass go on a feeding binge to make up for the lean months just past. Many fish are spawning, too, and these will quickly dart out to attack any intruders—including prop baits—that pass too close to their bed. For these and other reasons, fishing with prop baits is outstanding this time of year. Prop baits are bass catchers extraordinaire, and if these topwater plugs aren’t already part of your bassing blueprint, they ought to be. Try these 10 tips to get started. Run and Gun. Cast a prop bait and start reeling it back, with props spinning, at the very instant it touches the water. Get the reel in gear and start cranking fast just as the lure settles. Bass see what looks like a struggling baitfish, but they never have a chance to look it over in detail. Strikes often come before the lure moves a foot. Jerks Are OK. Another variation is retrieving the lure with a series of wiggles and jerks. This type retrieve can be combined with the same sort of “walk the dog” rhythm that top bass pros apply with stickbaits like Heddon’s Zara Spook. Get Their Attention. Where bass cover is dense, cast to the cover’s edge, and let the lure sit until all ripples subside. Twitch it then, just enough to rotate the props a time or two. If no strike comes, start a steady retrieve. The idea is to get the bass’ attention so it will swim over for a look. When it does, you want to make the lure appear as if it has seen the fish and is trying to escape. In The Clear. Clear water presents problems if you fish prop baits too slow. Bass may look but hesitate to strike when they see something unnatural. Goad them into striking by appealing to their reflexive instincts. Choose a prop bait that’s light in color and small in size, and when retrieving, keep the lure in continuous, turbulent motion. Don’t let the bass see the lure clearly. Keep your rod tip low, ready to strike. The Best of Times. Fish early and late hours religiously, especially during hot weather. Near dawn and dusk, surface water has cooled, forage animals are more prone to move on top, and bass feed actively near the surface. The water is generally calmer, too, so prop bait vibrations attract bass over greater distances. Bring ‘em up Right. During midday when there’s a lull in the action, trying a noisy prop bait will sometimes bring a bass up to see what the fuss is all about. It may not strike, but the next fish thus attracted may latch on. The Night’s All Right. Prop baits also are superb for night fishing. The continuous sputtering sound makes it easy to monitor the lure’s location, and with a steady retrieve, the line stays taut so you can detect strikes. Loop, Don’t Clinch. Don’t tie prop baits with the usual clinch knot; use a loop knot instead. Many prop baits don’t work right if the line is tied tightly to the screw eye. For free wobble and better hooking, loop knots work better. Be Alert. 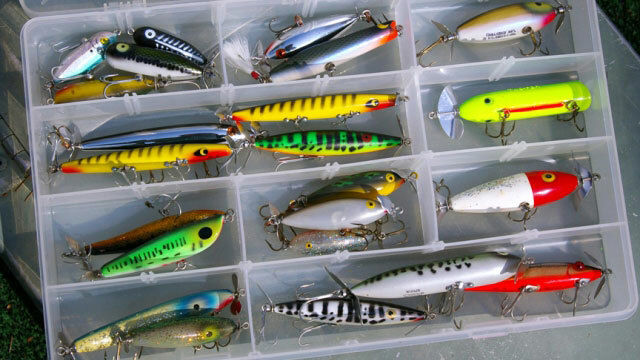 Many bass see the lure when it hits water and watch as it moves toward the boat. Just when you start to relax, Mr. Bass has had all he can stand and blasts water all over your surprised face. Many fish are missed because strikes come when least expected. Stay alert. Ready, Set... You should also concentrate to keep from taking the lure away from fish. At times, a bass will swirl the surface near a prop bait several times before it finally takes it. The key is setting the hook at just the right moment, when the bass grabs the lure but before it spits it out. Keep slack out of your line, and strike as soon as you feel resistance. If you’ve made up your mind to catch fish with prop baits, stay with it. Don’t make 10 casts and then switch to something else. Confidence is as important here as in any other method of bass fishing, and the only way to gain it is to keep that bait wet. Good luck!